Welcome to another edition of Blue News, the magazine for Genie customers throughout Australia and New Zealand. In my mind, the race to the bottom with rental rates is a combination of two independent causes. Firstly, as I have mentioned before, there is a lack of credible information as to what is an average rental rate is for particular models in the market. The U.S. rental industry has dealt with this issue by independently reporting average rental rates so owners have another source of rate information. I recently read in the HRIA magazine that our association is going to start gathering this information in Australia, which is a positive development for our local industry and hopefully will provide long-term benefits for our customers. The second reason centers around end user’s ”perceived value” between your company and your competition. Quite often, rental companies are required to meet the competition on price because the end user does not see the additional value being offered. When there is no difference in ”perceived value,” the only thing left to negotiate is the price. Product features & benefits – The new award-winning Genie® Z™-60/37 FE boom is a perfect example of a product specifically designed for increased value. This product replaces the need to have two machines because it can be used both inside and outside. For outdoor use, it has true rough terrain capability with AC drive motors, and for indoor use, it can be switched to all electric and outfitted with non-marking tyres for slab work. Genie 360 Support – When a machine has issues, the end user needs support fast because downtime costs money, and ultimately, the rental company as well. Genie offers real 24/7 tech support for end users, and if necessary, we dispatch our team of factory trained technicians to get the machine back up and running. We have technicians all over Australia supporting the end user every day. Genie Parts – When a machine is down, getting the right part quickly is critical to meeting the end users expectations of value. In Australia, we have always held over $6M in spare parts to support customers, but in the past, if we didn’t have the part it would mean going to the U.S. to get it. This has all now changed with the new Genie master distribution centre being set up in Singapore. For the end user, this means we have access to a much wider range of parts, which we can get to Australia more quickly, resulting in minimal downtime. Genie Lift Pro™ Training/VOC training – In some instances, end users are required to provide a machine specific license for the equipment they are operating on a particular jobsite. Genie can provide this training nationally on every model we sell. This solution allows the end user to get on with the job. By focusing on end user ”perceived value,” we can do our part in supporting rental companies in this very challenging market. On another note, I want to take this opportunity to announce that Mitch Ely has been promoted to a senior position with Genie in the U.S. and will be moving to Seattle with his wife. 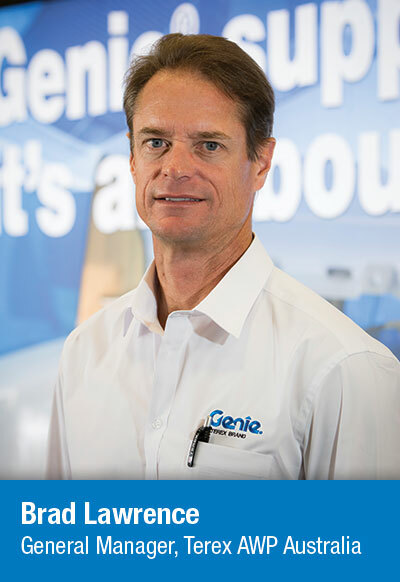 Mitch has been instrumental to the success of Genie in Australia and will be missed. To replace Mitch, we have decided to promote two team members from within: Mal McIntosh will be the new National Customer Support Manager, and Tim Merritt will be the National Product Support Manager. Both men are outstanding team members, and I am confident this change will over time provide an increased level of service for our customers. Also as part of the reorganization, we have promoted Kurt Kinder to National Sales Manager. Kurt is a great customer-focused sales leader, and in this new role, he will ensure the business stays laser focused on our customers and how Genie can provide value.